The Natural Dentist’s line of plaque removers, Stim-U-Dent, was featured in an episode of the hit Netflix Original Series Grace & Frankie! The show stars Jane Fonda and Lily Tomlin, who play two estranged women who find out that their husbands aren’t just work partners – they’ve been involved romantically with each other for the last 20 years. This situation forces Grace, a retired cosmetics mogul, and Frankie, a down-to-earth hippie art teacher, to learn to live with each other and figure out what the next chapter of their lives will look like. 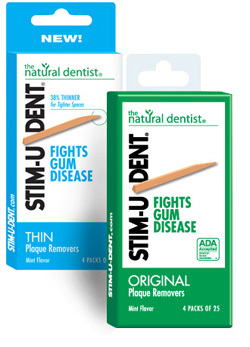 Watch as Frankie (Lily Tomlin) mentions The Natural Dentist’s Stim-U-Dent! Even Hollywood loves Stim-U-Dent! These plaque removers clean between your teeth like floss while also stimulating your gums. Their triangular shape and tapered point make them easy to use, keeping you clean and comfortable. And they’re conveniently packed so you can use them anywhere, anytime without being chained to your bathroom sink.